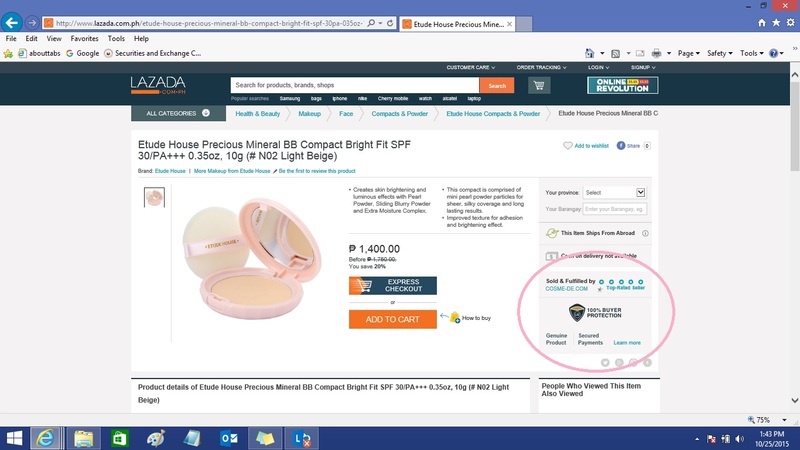 Have you encountered buying something you want to buy, but hesitating to shell-out cash because it's quite expensive, then suddenly you found a website that sells your favorite product that is in a crazily LOW price? What comes in first on your mind? 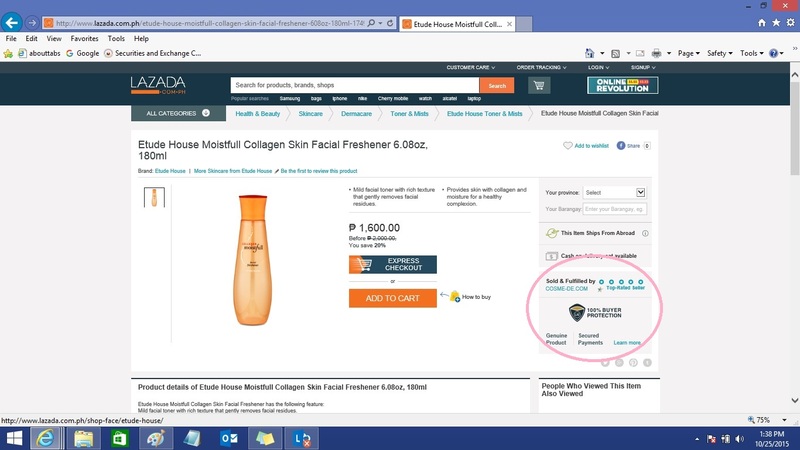 Are you gonna call or hit the BUY button? 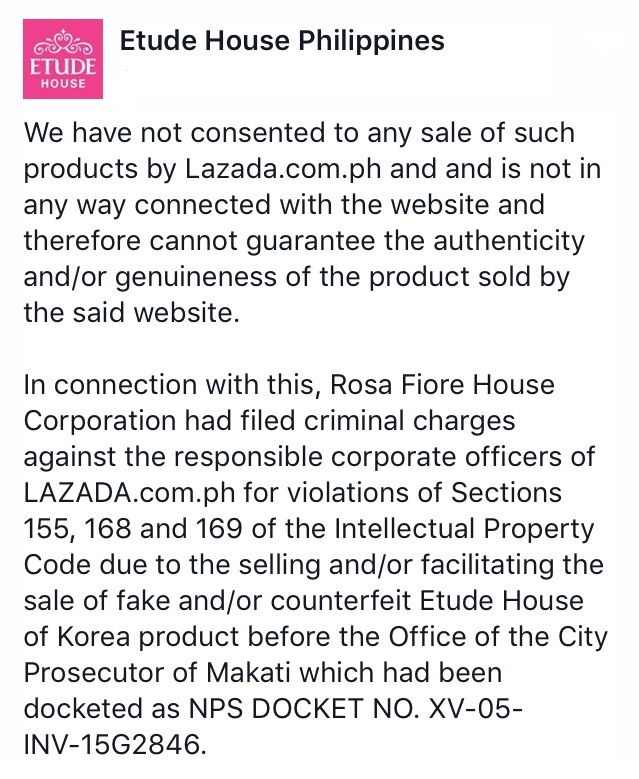 or are you going to wonder..
Rosa Fiore House Corporation, the legal distributor of Etude House in the Philippines had filed "criminal charges against the responsible corporate officers of Lazada.com.ph for violations of Sections 155, 168 and 169 of the Intellectual Property Code due to the selling and/or facilitating the sale of fake and/or counterfeit Etude House of Korea product before the Office of the City Prosecutor of Makati which had been docketed as NPS DOCKET NO. XV-05-INV-15G2846," it added. 168.1. A person who has identified in the mind of the public the goods he manufactures or deals in, his business or services from those of others, whether or not a registered mark is employed, has a property right in the goodwill of the said goods, business or services so identified, which will be protected in the same manner as other property rights. 168.2. Any person who shall employ deception or any other means contrary to good faith by which he shall pass off the goods manufactured by him or in which he deals, or his business, or services for those of the one having established such goodwill, or who shall commit any acts calculated to produce said result, shall be guilty of unfair competition, and shall be subject to an action therefor. c. Any person who shall make any false statement in the course of trade or who shall commit any other act contrary to good faith of a nature calculated to discredit the goods, business or services of another. b. In commercial advertising or promotion, misrepresents the nature, characteristics, qualities, or geographic origin of his or her or another person's goods, services, or commercial activities, shall be liable to a civil action for damages and injunction provided in Sections 156 and 157 of this Act by any person who believes that he or she is or is likely to be damaged by such act. 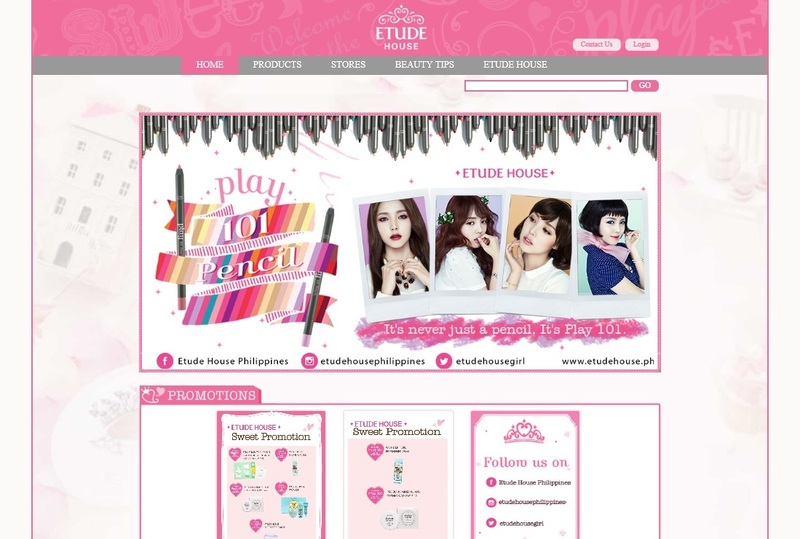 For those who haven't know yet, the only Philippine distributor of Etude House cosmetics in the Philippines is the Rosa Fiore House Corporation, with SEC Registration No. 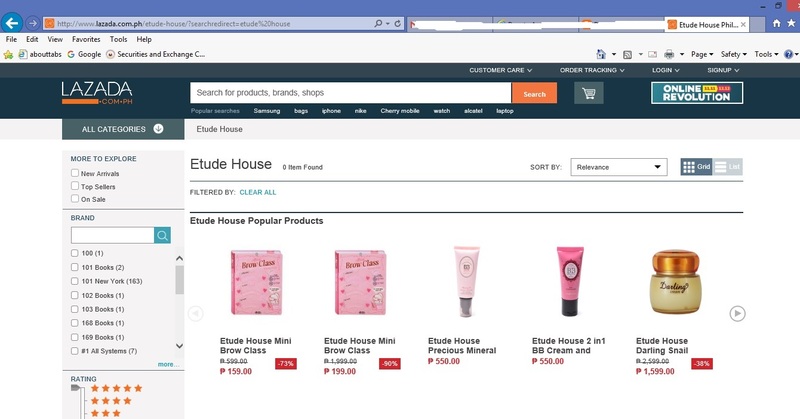 CS200917095, with registered business address at ACG Building, #5148 Filmore Street corner Zobel Roxas Avenue, Brgy. Palanan, Makati City, Philippines. 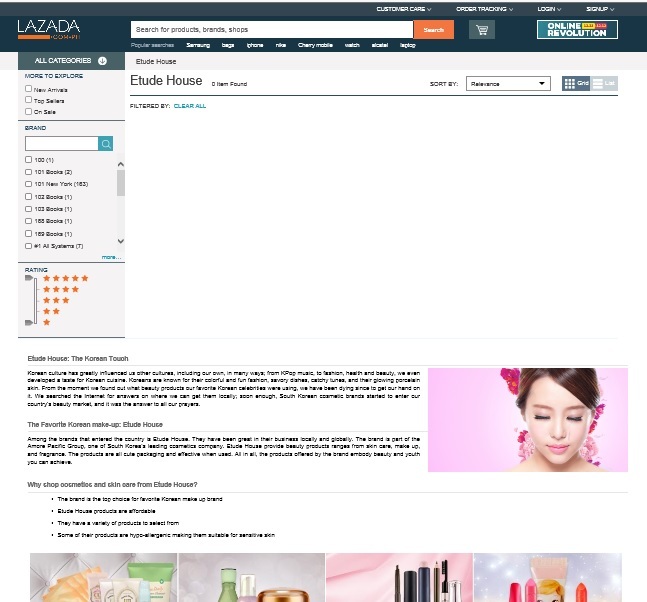 LAZADA.com.ph is an e-commerce site owned by the company LAZADA E-Services Philippines, Inc. with SEC Registration No. CS201203115, with registered business address at 3rd Floor Salustiana D. Ty Tower, 104 Paseo de Roxas, Makati City Philippines. 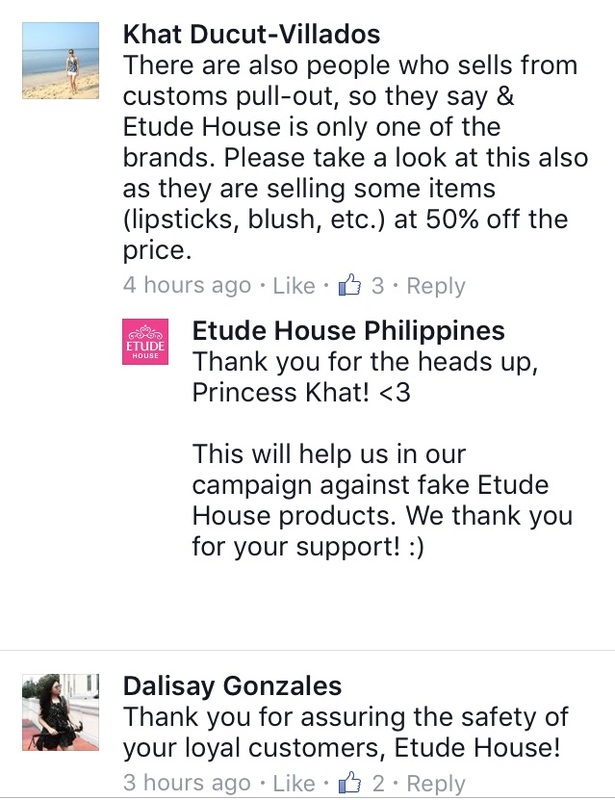 We are waiting for the Lazada Philippines to share their side about this unfortunate issue. 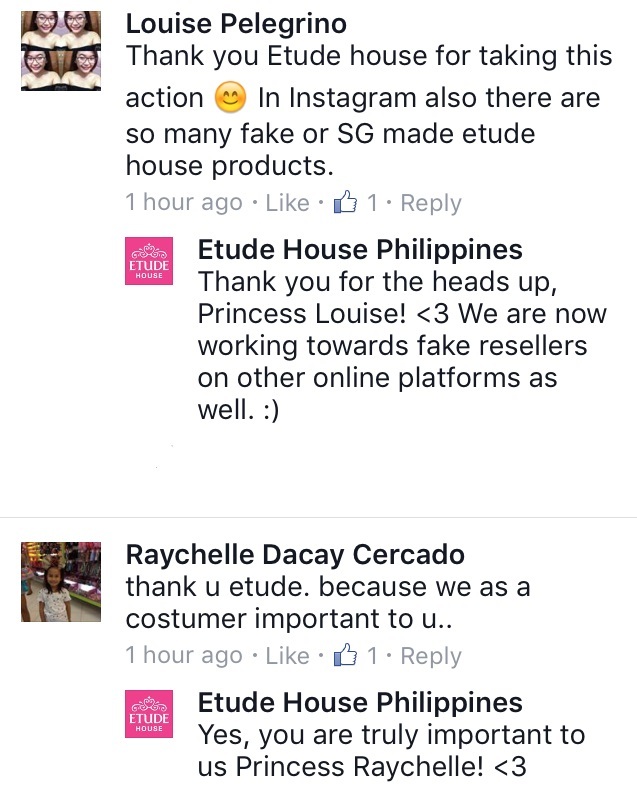 But for now, learn from our advice, and don't patronage FAKES. 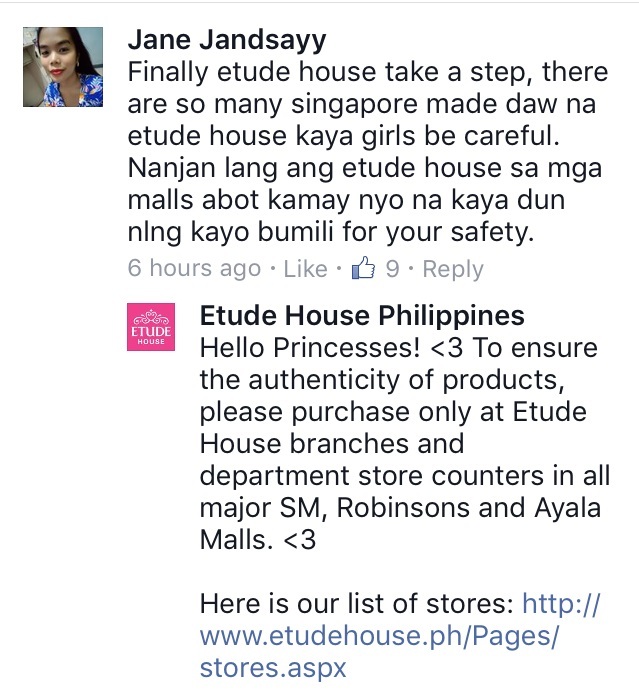 Thanks for the informative article but Lazada is still selling Etude products.